Some examples of video poker are more sophisticated than others and it’s probably fair to say that Double Bonus Poker from Microgaming falls into the category entitled ‘basic’. 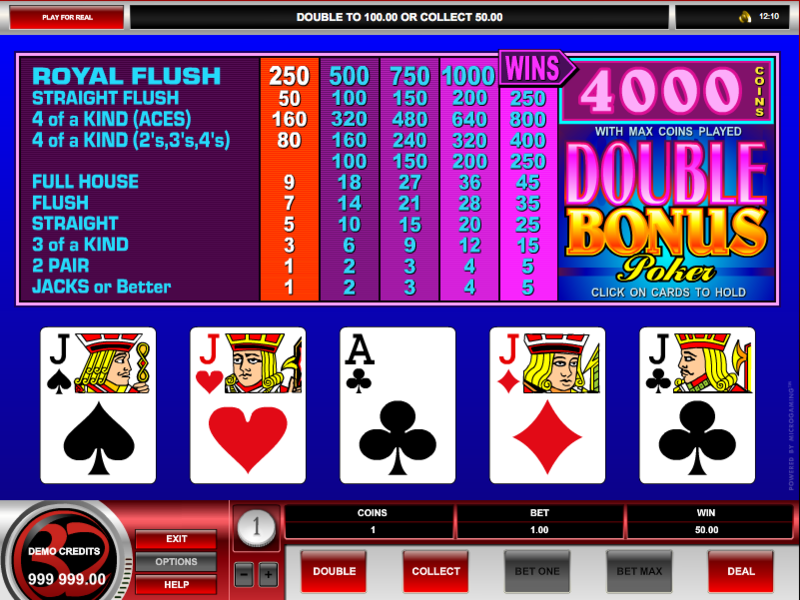 However video poker is such a simple game that aesthetics are not usually an issue so read on to find out what we think of Double Bonus Poker. When you load this game up you will be faced with a familiar screen displaying the paytable above the five cards which will act as your poker hand. Video poker is a version of draw poker which means you get a chance to replace your first dealt cards if you think you can make a stronger hand. It’s worth taking a moment to look at the paytable above the cards; this shows the various payouts available for the five coin levels. There are five coin levels depending on your budget but there’s a built-in incentive to go for five coins because the prize for landing a Royal Flush is 4000x your stake, hugely disproportionate to playing at a lower coin level. If you can afford it, go for it. The first to do is select that bet level using the ‘+’ and ‘-‘ buttons below the cards and then clicking on whichever column on the payable you fancy. Now just press ‘Draw’ and your first five cards will be dealt. After your first deal you can ‘hold’ whichever cards you want to keep and discard the rest which will be replaced. Only one ‘draw’ is allowed and the game will automatically hold any cards it thinks are useful for you – just click them again if you want to do something different. The lowest winning hand is a pair of Jacks so any pair lower than that is ignored; you will also notice from the paytable that 4 Of A Kind is spilt into three categories paying out at different levels as you can see from the screenshot above. You can gamble any win by clicking the ‘Double’ button below the reels; you will see five face down cards and the dealer will reveal the one on the left – find a higher card among the others to double your win. There’s nothing particularly wrong with this Microgaming version but there’s always an issue when the RTP is not listed because you can’t compare it other developers’ versions of video poker. Try it if you like but we would prefer to to direct you towards something like Net Entertainment’s Jacks Or Better.